One of these worms is a pest of canola. One is not. Show us your skills. Take the quiz. 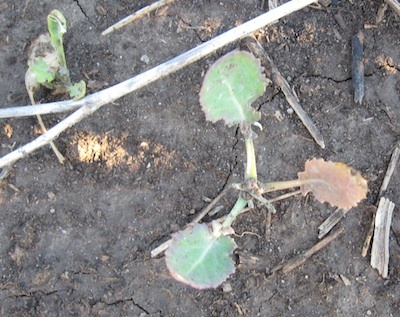 Many factors can cause a thin canola stand. Proper diagnosis is important for effective management. Here are common factors, with diagnosis tips for each. Many more photos are posted at the bottom of the article. Frost: Did the crop survive? It can take a few days after a frost before you can accurately answer that question. With a light frost of 0 C to -2 C, the risk of crop damage is minimal. With a heavy frost that kills off the cotyledons, it takes a few days before new leaves will start emerging from the growing point between the cotyledons. Frost: When can I resume weed control? No time to wait? Growers who want to do a preseed burnoff and then get seeding may not want to wait 3-4 days for the weeds to recover from a frost. In this situation, growers should recognize that if they go ahead and spray right away, efficacy may be reduced. However, even with the lower efficacy, doing the burnoff and then seeding may provide a higher return than seeding without the preseed burn and letting all the weeds compete until an early in-crop application. The reseed question. How many plants are enough? Research and grower experience over the years have shown that uniform stands of 1-2 plants per square foot will often outyield or match the yield of a reseeded crop with a much denser stand. Check the field closely. How much of the field is lost? Some seeds may still be in the soil, and for seedlings sheared off, there may be some later emerging seeds that could fill in the stand and provide reasonable yield potential. Yield may not be ideal but the potential is perhaps better than a reseeded crop. The Canola Council of Canada is looking for growers and agronomists willing to collect cutworms for research. Cutworms are an increasing threat to canola and other crops, and growers will benefit from knowing more about this native pest. Adjuvant systems used in in-crop herbicides used in canola are very effective tank cleaners and will remove the smallest residue of herbicide remaining in the tank and deposit it in your sensitive canola crop. If you can’t get enough sulphur for seeding, divide what you have across all your canola acres, then top up with an in-crop application of ammonium sulphate.Post-emergence sulphur can be applied up to flowering and still provide a yield benefit.